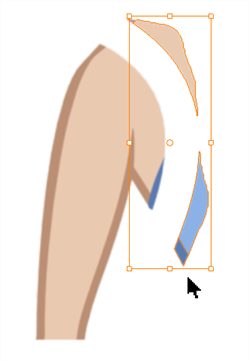 If you do not want to redraw all the artwork for your character, you can use the cut away technique where, with the Cutter tool, you select and send pieces of the model on a new layer. 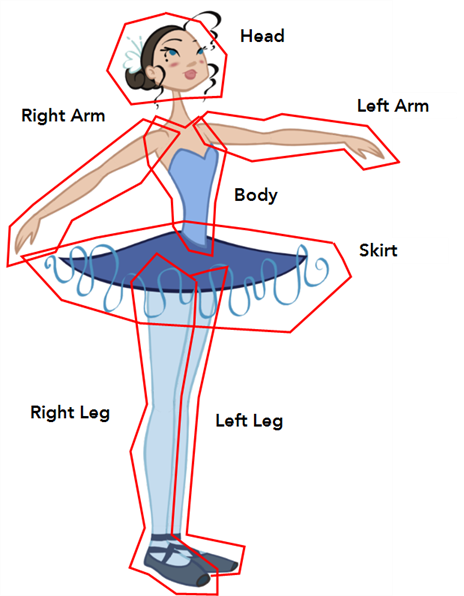 The first step in breaking down your character is to do a rough cut down of the main parts such as the body, arms, legs and head. Use the Create Drawing from Drawing Selection feature to automatically create your layers and copy your selection in it. 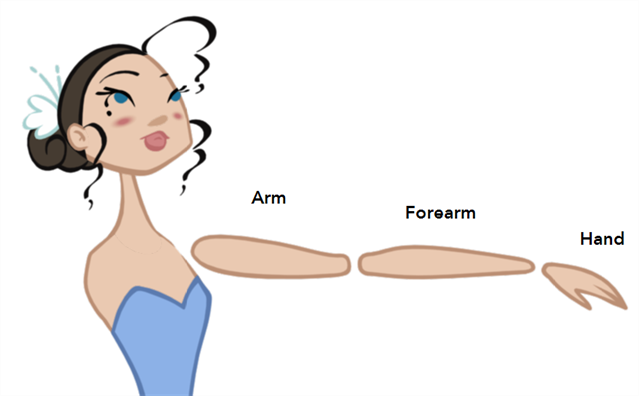 To break down the main body parts, you will use the Create Drawing From Drawing Selection feature. There is no need to create any layers prior to this process, you need to have your model well centred and sized in the Camera view. You do not need to make clean cuts around your parts; a rough one is quite sufficient as long as it includes all of the artwork of the part you want to break down. You will clean the extra bits and pieces later. 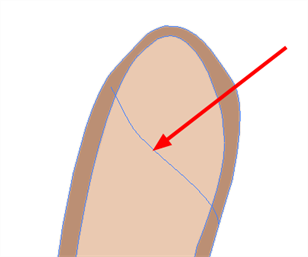 You will use the Cutter tool to roughly cut the main sections. 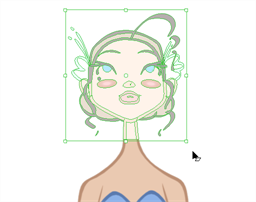 You can also use the Select tool to select precise lines and colour zones. 1. In the Timeline view, select the model's cell that corresponds to the first view to break down. 2. In the Tools toolbar, select the Cutter tool. ‣ If you prefer to use the Select tool, choose the Select tool from the Tools toolbar or press [Alt] + [S]. ‣ In the Tool Properties view, you can switch to the Lasso selection mode. 3. In the Camera view, create a selection around the first part to break down. If you click on a zone, the Cutter tool will select the zone. It will end the selection at the first point of intersection that it meets. ‣ If you hold down [Shift], you can create a new lasso selection around another zone and add it to your previous selection. 4. 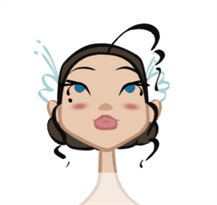 In the top menu, select Edit > Create Drawing From Drawing Selection or press [F9]. 5. In the Layer Name field, type the name of the layer you want to create following the naming convention you established previously. 6. Make sure to disable the Cut Artwork From Source option in order to keep the selected artwork on your original drawing. 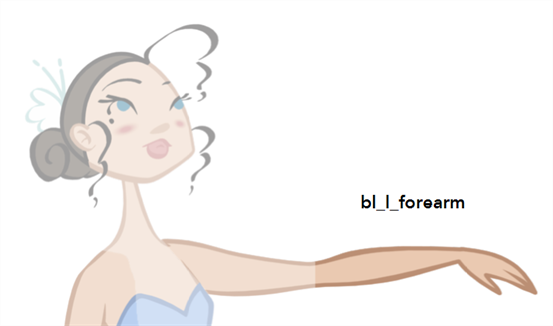 You do not want to cut the artwork from your colour model. 7. Click on the OK button to complete the operation. The new layer is created and your selection is copied in it. The drawing is created in the same frame number as the cell it was taken from. 8. Repeat Step 1 to Step 7 for each main body part. You should now have a layer for each main part of the character for the first view to break down. You are now ready to break down those main pieces into smaller ones. Breaking down the secondary parts is similar to the main part break down process except that this time you will cut away the artwork from the layer it has been selected from. 1. 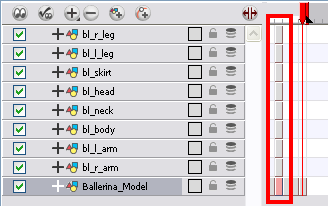 In the Timeline view, lock your model layer by clicking its Lock button. 2. In the Timeline view, select the cell that corresponds to the main part you want to break down. 3. In the Tools toolbar, select the Cutter tool. 4. In the Camera view, create a selection around the part to break down. 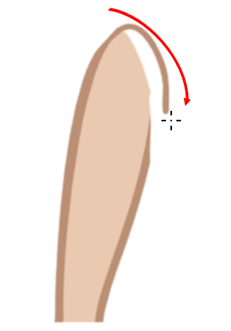 ‣ If you click on a zone, the Cutter tool will select the zone. It will end the selection at the first point of intersection that it meets. 5. 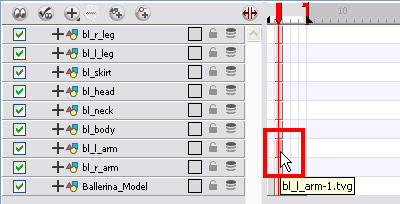 In the top menu, select Edit > Create Drawing From Drawing Selection or press [F9]. 6. In the Layer Name field, enter the name of the layer you want to create, following the naming convention you established previously. 7. Enable the Cut Artwork From Source option in order to remove the selected artwork from your original drawing. In this case, you want to cut the artwork from your colour model. 8. Click on the OK button to complete the operation. 9. Repeat Step 2 to Step 8 for each body part. If you forgot to add some artwork to a layer you previously created, you can always add it later. 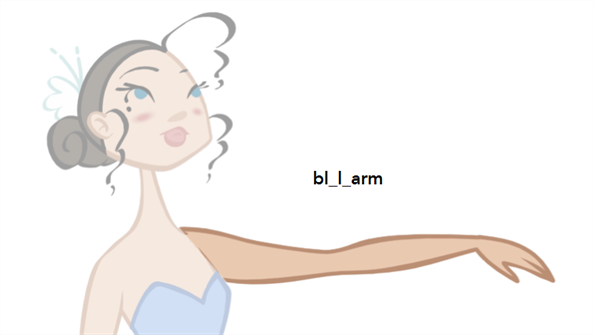 In the Camera view, select the artwork to send to the existing layer. 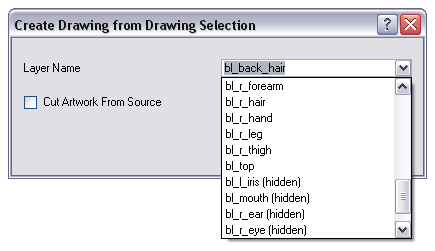 Open the Create Drawing from Drawing Selection dialog box. The [F9]. In the dialog box, select an existing layer from the drop-down list instead of typing a new name. 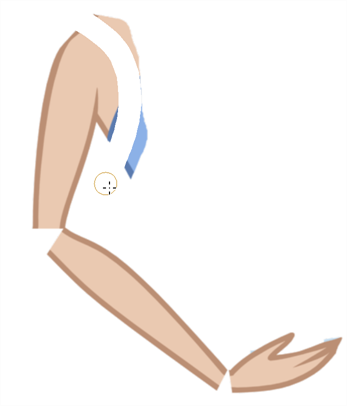 When you click on the OK button, the artwork will be added to the existing drawing in the layer you selected. Your first view should now be completely broken down. If your articulations are still rough and bits and pieces are missing you will fix those in the next step. Repeat the following steps for each extra view you have to break down. 1. In the Timeline view, selected the model's cell corresponding to the view to break down. ‣ If you prefer to use the Select tool, in the Tools toolbar select the Select tool or press [Alt] + [S]. 3. In the Camera view, create a selection around the first part to break down. 5. In the Layer Name field, select the corresponding layer from the drop-down list if you want to use the same layers or type a new name if you want to create a new layer. 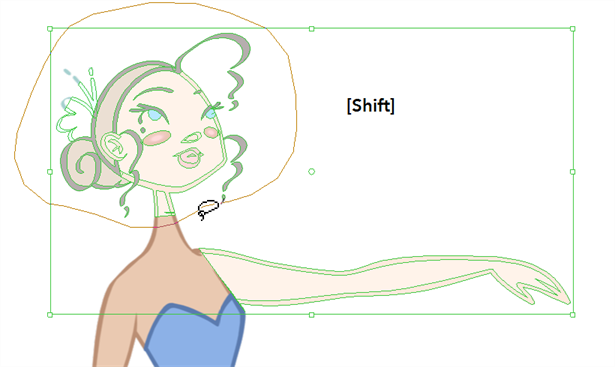 To break down the secondary parts for your extra views you will follow the exact same process as you did for the first view you broke down, but you will incorporate the new parts in the already existing layers—see Breaking Down the Secondary Parts. Each view can have its own set of layers in the Timeline, so that each view does not necessarily need to have the same layer structure. Now that all of your layers are created and your parts are basically broken down, it is time to clean up your parts and complete the articulation. 1. 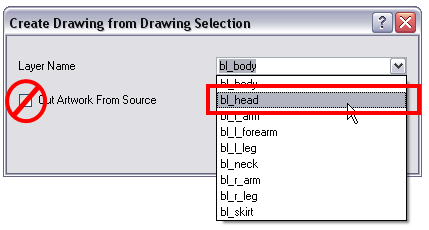 In the Tools toolbar, select the drawing tool you need to fix your drawings. 2. In the Timeline view, select the cell containing the drawing to fix. 3. In the Camera view, delete the extra bits using the Select or Cutter tool. 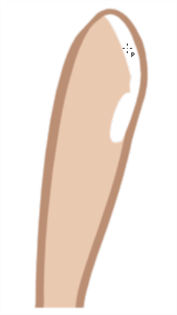 You can also use the Eraser tool. 4. 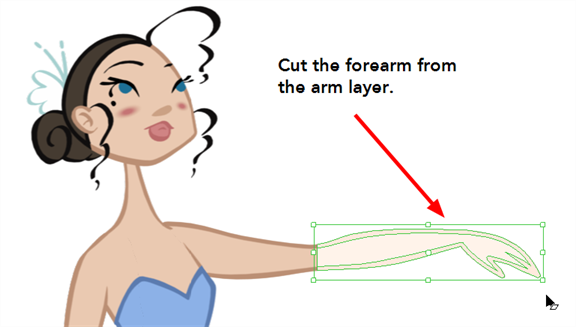 Draw the missing lines using the Brush tool. If you use the Brush tool, it is recommended that you enable the Auto-Flatten option in the Tool Properties view. 5. Using the Paint tool, paint the gaps. You can close some gaps with invisible lines using the Close Gap tool. The keyboard shortcut is [Alt] + [C]. 6. 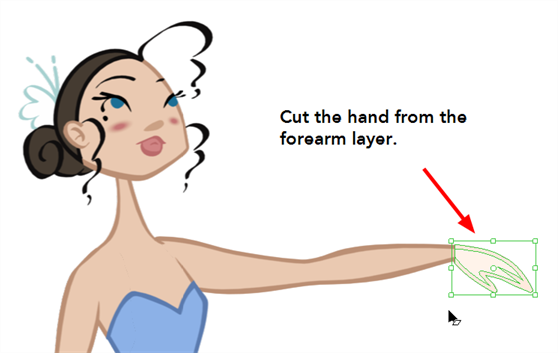 Reshape your lines using the Contour Editor tool. The keyboard shortcut is [Alt] + [Q]. 7. Using the Select tool, select your entire drawing and click on the Flatten button in the Tool Properties view to flatten your drawings. 8. 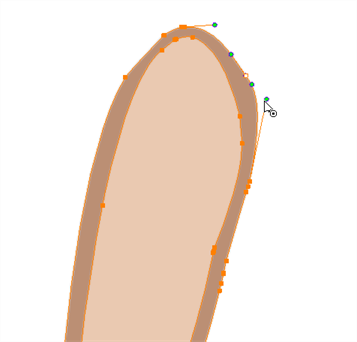 In the top menu, select View > Show > Show Strokes to display the invisible lines that could be present in your drawing or press [K]. 9. In the top menu, select Drawing > Optimize > Remove Extra Strokes. 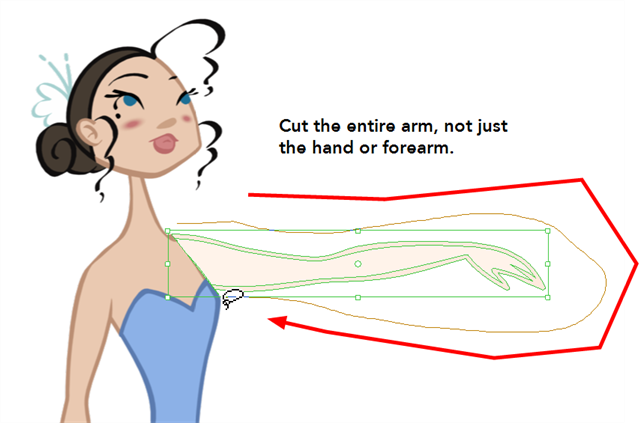 This operation will remove any unnecessary invisible lines in your drawing. 10. Repeat this entire process for each drawing to fix.